Learn about the 3 types of cacao used to make chocolate! 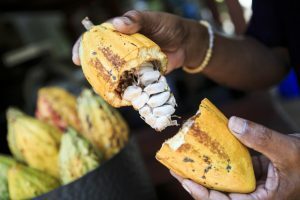 While many of us are familiar with cocoa and chocolate, many people haven’t heard much about cacao. Even though cocoa and cacao have similar spellings, they have some key differences. Cacao beans are harvested from pods; cocoa is what results when these beans are roasted at high temperatures. Cacao comes in three main varieties; here’s some information about the different types of cacao you should know. Forastero cacao is the most commonly used variety and it can be found in about 70% of all the chocolate in the world. This popularity is largely due to the trees’ strength and crop yield. The beans that come from these trees are also called “bulk beans”. At first, the trees that grow Forastero beans only grew in the Amazon. Now they can be found all over the world; however, they are mostly found in West Africa. Forastero beans are extremely popular, but they do take a relatively long time to complete the fermentation process. Criollo, which translated from Spanish means “native”, was formerly the most common form of cacao. Unlike Forastero trees, criollo trees have a relatively low yield and are more likely to experience disease. These facts, along with the fact that they can be expensive to grow, result in Criollo cacao being used in only 10% of chocolate. However, it does have a tasty flavor and low acidity levels, so it makes delicious chocolate. Trinitario cacao is a blend of Criollo and Forastero that is a little bit sweeter than Forastero. While this type of cacao blends some of the best qualities of each of the previously mentioned ones, its characteristics aren’t as strong. DELICIOUS CHOCOLATE AT WOCKENFUSS CANDIES! Wockenfuss has all of your favorite Easter treats! Whether you prefer chocolate Easter eggs, Easter bunnies, or jelly beans, Wockenfuss has what you and your loved ones will enjoy. Since 1915, Wockenfuss has been a family owned and operated business creating the finest confections in Baltimore, Maryland. With our nine convenient locations throughout Maryland, there is sure to be a Wockenfuss store near you. Come and visit us to see our selection of favorites such as our gourmet truffles, chocolate specialties, and much more! This entry was posted on Monday, April 1st, 2019 at 9:12 am. You can skip to the end and leave a response. Pinging is currently not allowed.